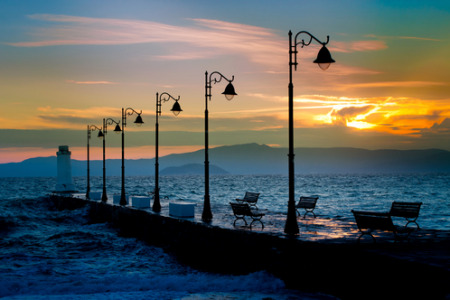 Pefkohori is located in Halkidiki on the Kassandra peninsula in northern Greece. The resort is surrounded by pine forests, the scent of which fills the air. Pefkohori holidays offer relaxing days by the sea, sunbathing on the beach or swimming in clear water. The palm lined promenade is filled with all kinds of eateries from traditional tavernas to fast foods and pizzerias. Holidays in Pefkohori are popular with all age groups as they can be as relaxed or as active as you wish as there are many opportunities for sightseeing and also a variety of recreational activities. The town is comprised of old and new centres with the latter being closest to the beach. The old village is very attractive with narrow winding streets filled with small shops and pavement cafes. We have a number of cheap Pefkohori holidays which offer surprisingly good value. Bargains such as these fly from the shelves so if you are interested, you need to act quickly. For further details and to find our latest Pefkohori holiday deals, please use the search facility.